"Sampath Speaking" - the thoughts of an Insurer from Thiruvallikkeni: Bear attack ~ what to do - to drop dead or ??? Bear attack ~ what to do - to drop dead or ??? 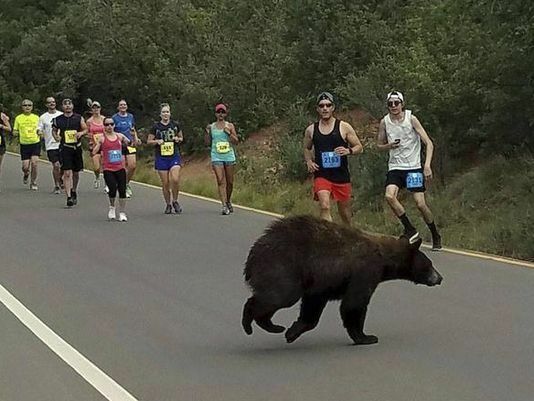 USA Today reported that runners in the Garden of the Gods 10-mile run got a furry surprise when a bear made an unexpected appearance during the race in Colorado. A man by name Donald Sanborn was halfway through in the race, when he snapped pictures of a bear crossing a roadway near Colorado Springs. Sure it disrupted his chances in the race ! 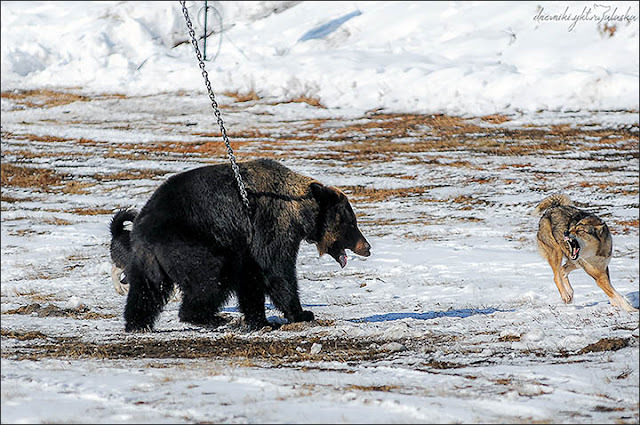 Bears on road are not common – though they are chained and exhibited. Have seen bears tied to rope made to walk on roads of Agra. Elsewhere in Siberia, dogs are trained to attack and harm chained bears ! Miles away, the American black bear (Ursus americanus) is a medium-sized bear native to North America. It is the continent's smallest and most widely distributed bear species. Black bears are omnivores, with their diets varying greatly depending on season and location. They typically live in largely forested areas, but do leave forests in search of food. Sometimes they become attracted to human communities because of the immediate availability of food. It is listed by the International Union for Conservation of Nature (IUCN) as a least-concern species, due to its widespread distribution and a large global population estimated to be twice that of all other bear species combined. They are considered as irritants to bee keepers as often the honey loving black bears attack the protected beehives, damage the wood boxes and kill the bees too. In my childhood have read this moral story in Tamil, which perhaps most have read in their mother-tongue. Long ago, there lived two friends – Ram and Sam – many a days they would walk into the nearby forest, collect woods and other material for material. Rarely they would encounter wild animals, and mostly would run away in fear escaping from possible danger. They had a pact to help each other in trouble. On a rainy day with not much of sunlight – inside the forest, suddenly they saw a bear at a distance. They were frightened and did not know what to do ! Innocent Ramu was totally lost in fear and was trembling – Sam who had the ability to climb tree was a bit cunning too. He thought that if Ram was exposed to the bear, his escape would be easier. Advising Ram to fall flat, Sam climbed a tree without even trying to help Ram, and hid himself. Ramu lay on the ground as the bear came nearer and sniffed him – he held his breath pretending as if dead. Perhaps the bear was not so hungry or perhaps it was fooled by the act ~ good time for Ramu, the bear went away without harming him. Now Sam got down and was curious to know what had happened. He asked, I saw the bear coming near your ear and uttering something.. .. .. what did it say ? - a composed Ram retorted ‘be wary of your friends !’.. .. ‘the conclusion is not that bears will not eat / harm a dead man, but one must have only trustworthy and true friends and not one who would run away in danger’. 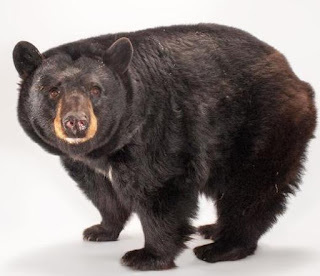 Miles away, a man (not sure whether he had read this bear story) was sleeping under the stars in the mountains near Boulder County, Colorado, on Sunday morning; this 19-year-old camp counsellor was awoken by what he initially perceived to be a loud crunching sound. The sound, it turned out, was a black bear pressing onto his head as it dragged him from his sleeping bag. Speaking with local Denver news station KMGH-TV, the teen, who was identified only as Dylan, claimed he believed the crunching sound was caused by the bear's teeth digging into his skull. As the bear tugged at him, Dylan and the four other campers sleeping by the lake tried to fight the bear off. He estimates the bear dragged him a total of 12 feet before he was able to pry himself free. Dylan teaches wilderness survival at the camp and knew the best way to fend off a black bear attack is to fight back. He and the other campers attempted to scare the bear away before it eventually left. (When confronted with other bears, such as grizzlies, experts recommend curling into a ball.) The 19-year-old was treated at a nearby hospital and received staples for his wounds. "I'm not afraid of the bears. I'm not afraid of sleeping outside anymore. You just have to be aware and respect the animals," Dylan told KMGH-TV. Colorado Parks and Wildlife is now on the hunt for the bear, which they say they will euthenize if it can be caught. Initial surveys of the campgrounds after the attack did not find any food that could have attracted the bear, making the incident even more unusual. In fact, the unprovoked attack has rattled the community so much that any bear caught in the area over the next few days will likely be euthanized, Colorado Parks and Wildlife spokesperson told the Associated Press. "It sounds like a predatory attack. I assume the bear was intent on killing and eating that guy," said Dave Garshelis, a wildlife research scientist with the Minnesota Department of Natural Resources who studies bears. Garshelis explained that bears are typically wary of people, and it's likely the bear was trying to drag Dylan away from the other campers so that it could more easily prey on him. That would mean, he would not have been dragged but attacked, had he been alone !! This isn't the first shocking black bear attack to take place this summer. On July 5, Colorado Parks and Wildlife reported four black bears had been killed in one day. Two of the bears were shot by homeowners after they entered homes and two were euthanized by state officials after killing livestock. Colorado Parks and Wildlife spokesman Joe Lewandowski told local news that the decision to kill bears depends on how aggressively each bear has behaved and if it presents a threat to human safety. In the past week, the state office has received over 100 calls about bear sightings that qualify as conflict situations, or situations in which bears present a threat to safety. Durango Herald quotes a person stating that July can be a difficult month for bears to find food. As the lush spring vegetation dries and August berries are yet to bloom, bears have a more difficult time foraging. The notoriously opportunistic eaters often wander into human areas in search of dinner. As many as 88 percent of bear attacks are caused by a male black bear on the prowl for food, according to a 2011 study. Black bears are not typically aggressive toward people, but several factors could explain the recent increase in reported incidents. As humans increasingly encroach upon bear territory, the chances of a dangerous encounter with the animals become more likely. In Alaska, for example, human populations have nearly doubled in the past 60 years, and Colorado is seeing some of the fastest population growth in the nation. Black and grizzly bears also have healthy, growing populations in North America. thousands of FC Köln fans invade London ..
Shakespeare Stage - Theatre fires !! Mayors ~ acting, fearsome and one day Mayor !! !